This week we are getting mixed responses for changes in rules dealing with apprentice and journeymen licensure. For example, new licenses have been proposed to help electricians enter the workforce in a shorter amount of time. While this effort solves problems in over regulation, there are strong feelings on both sides of this issue. The Natural Resources Committee passed HB 01 to the Senate Floor that deals with senior water rights and flood releases. This bill will maintain the senior rights which have not been honored in the past. In addition, I spoke at a press conference at Governor Little's office earlier today. The Governor has been taking great strides to cut down on over regulation and I spoke at the press conference to show my full support. Below are some recent activities. I hope you will enjoy the information. For more details, you can log onto legislature.idaho.gov where you will find bills, committee recordings and live stream videos of our House and Senate floor sessions. I look forward to your involvement. Idaho business owners from across the state came together at the Capitol this week to participate in the 2019 Buy Idaho event in the rotunda. Buy Idaho is a nonprofit membership organization promoting Idaho products, services, and businesses. For over 30 years, Buy Idaho has supported the state's business community and championed efforts to help Idaho companies grow and prosper. The goal of Buy Idaho is to keep tax dollars in Idaho through business building and increasing job opportunities, thereby improving the quality of life for all Idahoans. Click here to learn more about Buy Idaho. This week, the Idaho Potato Commission (IPC) visited with members of the Legislature to update them on the activities and promotions currently underway at the Commission. 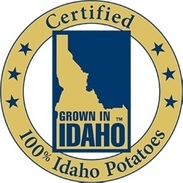 Established in 1937, the Idaho Potato Commission is the state agency responsible for promoting and protecting the famous "Grown in Idaho®" seal, a federally registered trademark. 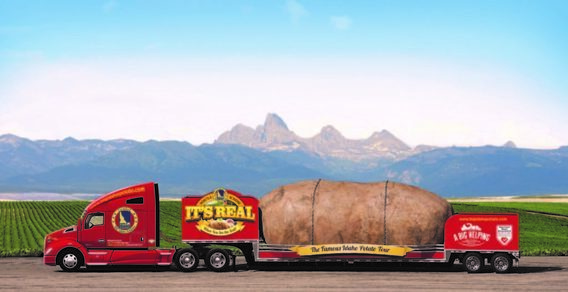 The seal assures consumers know they are purchasing genuine, top-quality Idaho® potatoes. Idaho's ideal growing conditions, including its rich, volcanic soil combined with its excellent climate and irrigation, differentiate Idaho potatoes from potatoes grown in other states. In 2017, Idaho harvested 310,000 acres of our famous potatoes with a production value of $974,966,000. Click here to view the Idaho Potato Commission website. 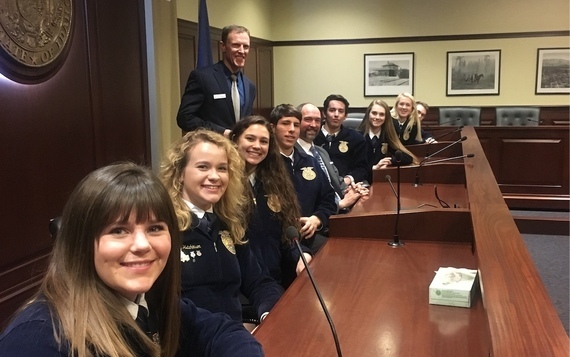 Wearing their traditional blue jackets, hundreds of Idaho FFA members from around the state met with Legislators and agricultural industry leaders for their annual Cenarrusa Day on the Hill. This event allows FFA members the opportunity to learn in person how public policy is formed by the Legislature. This annual event is named after Idaho’s former Secretary of State, Pete Cenarrusa, who passed away in 2013. Cenarrusa began teaching ag classes at Cambridge and Carey High Schools. He went on to serve in Idaho’s Legislature and in the executive branch of State Government; he served a total of 51 years, making him the longest serving public servant in Idaho’s history. His widow and wife of 66 years, Freda Cenarrusa, attended the FFA awards luncheon. Each year, cancer advocates from across the state gather at the Idaho Capitol striving to make a difference in the lives of countless Idahoans. 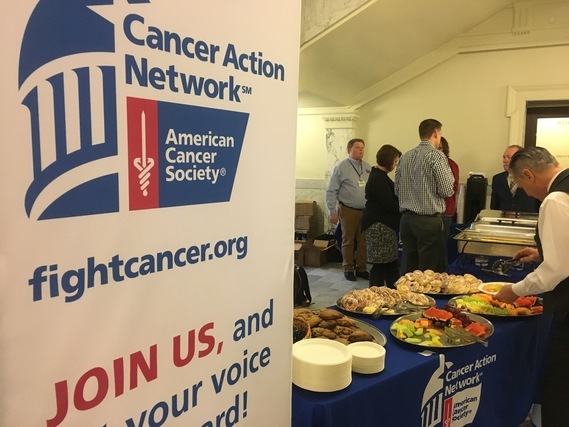 On Monday, members of the American Cancer Society Cancer Action Network (ACS CAN) came to the Capitol to visit with lawmakers and educate the public on the role of the ACS CAN. The ACS CAN is a grassroots member organization that gives cancer advocates, survivors, and caregivers the opportunity to shape legislative agendas ensuring awareness of important cancer issues. Click here to learn more about Idaho Cancer Action Center and the American Cancer Society Cancer Action Network.